When Venus is in the western sky after sunset, it is known as the evening star. It is a time when Venus is most prominently seen. For most of 2015 Venus will be quite visible in the evening as it approaches greatest elongation in May. Because Venus and Mercury orbit closer to the Sun than Earth, we never see them far from the Sun in the sky. They are either in the evening sky just after sunset, or in the morning sky just before sunrise. The angular distance of a planet from the Sun is known as elongation, and the largest angle a planet reaches before moving closer to the Sun (in the sky) is known as greatest elongation. The greatest elongation of Venus is pretty consistent, only varying between 45 and 47 degrees. 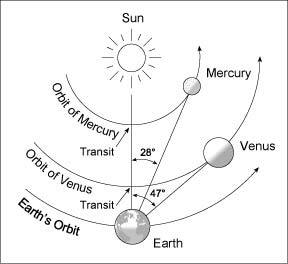 Because of its more eccentric orbit, Mercury’s greatest elongation can vary between 18 and 28 degrees. With a much smaller elongation, Mercury can be particularly difficult to observe. Even when Mercury is at greatest elongation it can be close to the horizon. That’s because it also depends upon the time of year it occurs. The planets tend to orbit the Sun in a similar plane, known as the ecliptic. The seasons occur because of the axial tilt of the Earth relative to the ecliptic. Near the winter or summer solstice, the ecliptic has about a 20 degree tilt relative to the horizon. Near the fall or spring equinox, the ecliptic is nearly horizontal with the horizon. So the best time to view Mercury is when it is at greatest elongation near one of the solstices. Over the next few days, Mercury has fairly favorable viewing conditions. It’s elongation is relatively good, and it’s still close to the winter solstice. More importantly, it is near Venus in the sky as well. Venus is much easier to find, being brighter, so if you find what appears to be the brightest star in the sky just after sunset, then you’ve found Venus. If you look a bit to the right of Venus over the next few days, you’ll find what appears to be a dimmer star, and that will be Mercury. You can see the exact positions day by day in the video. If you happen to have a clear evening, definitely track down Venus and Mercury. Venus is always a wonderful sight, and if you find Mercury, you’ll have found a planet most people haven’t seen in the sky.